Herbert Backe (1 May 1896 – 6 April 1947) was a German politician and war criminal. He was born in Batumi, Georgia. He worked in the Third Reich government and was made Minister of Food in May 1942 and Minister of Agriculture in April 1944. 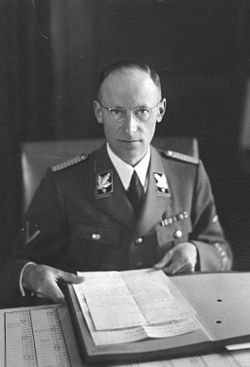 He had that job in the short-lived Cabinet of Admiral Karl Dönitz in the last days of World War II, from late April to May 1945, as the political request of Adolf Hitler. During the war, Alfred Rosenberg said that Backe should become the leader of the Ukraine Reichskommissariat (Nazi government in the Ukraine). He was one of the people who planned and made happen the Hunger Plan - a plan to starve to death tens of millions of Slavic people in order to make sure there was enough food available for the German people and military. He was taken prisoner by the Allies after the war, he was to be tried in the Ministries Trial, but he killed himself by hanging in his cell at Nuremberg on 6 April 1947. This page was last changed on 29 September 2017, at 08:40.